Temporary Abilities are additional effects appended onto units for a limited time. These effects may increase various stats, improve drop rates, or provide support in different ways. 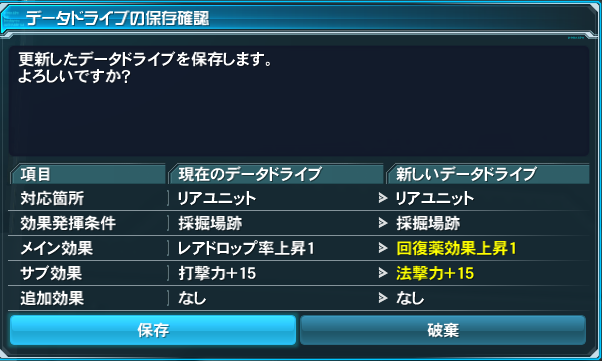 To get started, you must first “Update a Data Drive,” then craft “Temporary Ability Data” items. 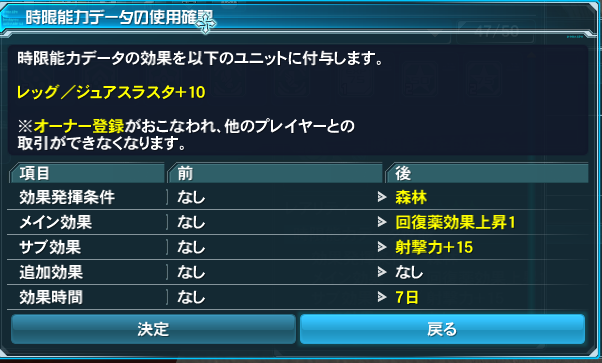 After the entire process is complete, you may use these data items to attach the abilities onto units. ※ Performing this action binds the unit to its owner. This prevents the item from being sold or traded to other players. The information presented below is in an unfinished state. More details will be added in the upcoming days. Head to a [Crafting Terminal] or [My Room Terminal] to get started. Select a crafting line and choose a recipe. The window displayed in the middle on the right side lists the main effect that has the greatest chance to appear. This window will update with a different main effect each day at 13:00 JST. Crystals corresponding to the recipe’s planet. Unit Crafting materials corresponding to the location of the unit. Insufficient materials will appear in red text. These items can be found in quests or purchased from player shops. These items can be obtained through Item Desysnthesis or purchased from player shops. 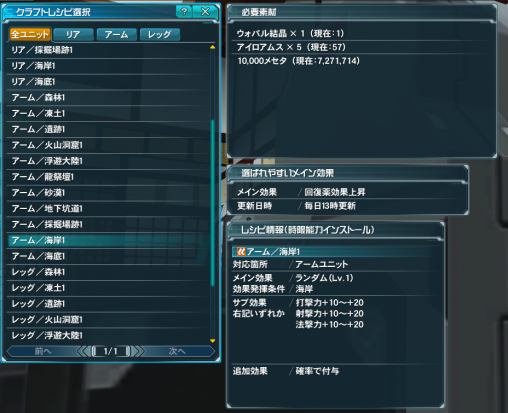 This menu lists the crafted data drive’s effects and stats. Data Drives are saved into one of three slots corresponding to the unit’s location on the body. Please be aware that crafting a new data drive will overwrite whatever was saved on that slot. A screen like the one above will appear asking if you’d like to overwrite the data drive. Press the left button to save (保存). Once you’ve finished saving a data drive, you can start crafting items that attach to the unit. Choose one of the three data drive slots and supply the required materials. [Temporary Ability Data] crafting is more concerned with the time frame the effect lasts. If you are unhappy with the recipes shown in the Data Drive selection screen, please refer to the 3 tabs in the previous section. Select a Crafting Line and a Data Drive to initiate the crafting process. After the craft is complete, an item like the one displayed above will appear in your inventory under the consumables tab. Refer to the Data Drive section at the top of this post for more details about these effects. Those who achieved a [Great Success] upon crafting this item will have more days added onto the effect. 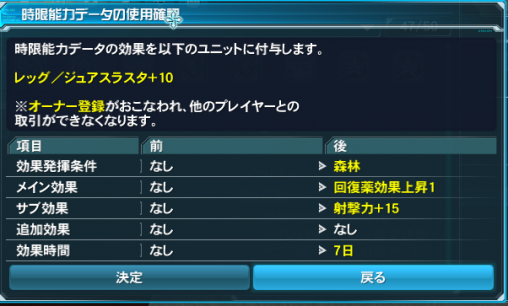 Check the consumables tab in your inventory to apply the Temporary Ability to the unit. When the item is ready to be consumed, the confirmation screen will target the unit currently equipped to your character. The unit it selects is based on whether the data applies to rear, arm, or leg units. Press the left blue button to apply the ability ※ Please Note: Performing this action binds the unit to its owner. More information will be added in the upcoming days. A translated DB would be super, since Cirno committed sudoku. I think you mean Seppuku and not Sudoku. Cirnopedia is still useful for Stat buying and the JP names for items. Cirno uses a literal translation whilst Aida’s team make English patches that better suit the auidence, less literal and easier to understand. This is why we get the word Alba on Cirno but Alva on the patch. BTW Sudoku is a Japanese number puzzle. You took the joke too literal. Hey buddy, I threw together a quick page on what abilities are available and how they apply. Let me know if you have questions or of I could be more clear. Thank you, i’ll add some information in later this week. And for people who are wondering, yes, the Area-Wide All Ruins installations apply to the current limited time quest, Boundary-Tearing Silver Steel Blade. 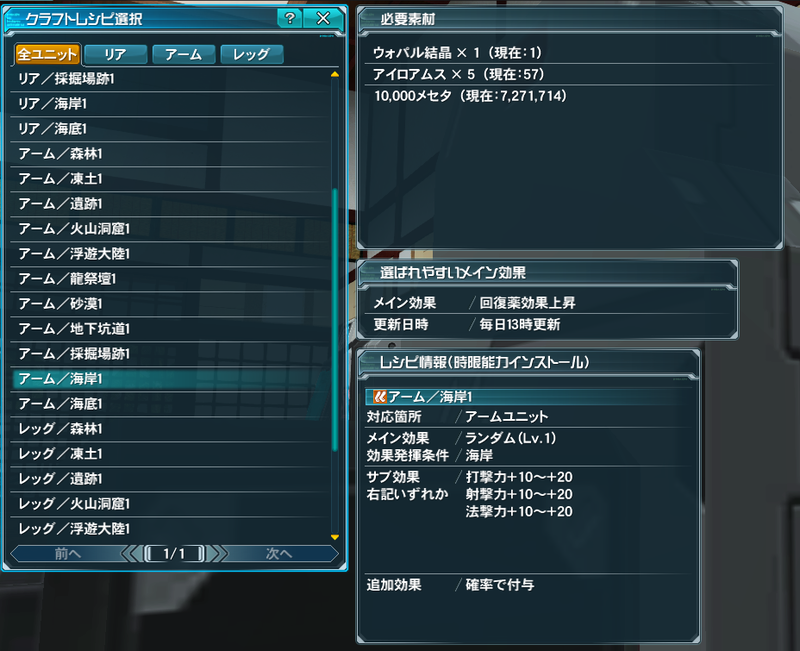 You can only get Lv1 abilities for it, since it’s neither a Free Quest nor an Arks Quest, but every little bit helps (especially Rare Drop Rate boosts). Fortunately, the Area-Wide data chip recipes are available to every player from the get-go, so you can craft for yourself!